Your space ship enters an asteroid belt, try to avoid collisions! wxAsteroids is a game demonstrating the wxHaskell GUI. You will get a message about the directory in which the executable is installed; this directory must be in the search path. Use the left and right cursor keys to move the ship sideways. 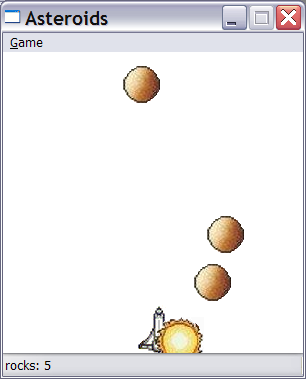 Ctrl-n creates a new window with a new Asteroids game. Ctrl-p pauses/resumes the game. To increase the speed of the space ship, press '+'; to slow down, press '-'. This page was last modified on 21 September 2014, at 19:22.